Confused. Haven’t got maxima but doesn’t it do the same thing ie basically increase the volume without clipping ? I use them both for different things. The DDMF Limiter (No limits) seems to be a classic limiter that I use to keep extreme things like ApeFilter and Turnado from clipping and completely going to crap, when they inevitably overload things. i also use it for more dramatic effect on things when i want loud and thick. I use Maxima for a more transparent... uhhh ‘level sweetening’ when I want naturaly ‘compressed’ (but not sounding compressed) things with ease. It is the sort of thing a good engineer with more experience can do better with a wider range of tools than I can. It feels like a shortcut but I do love it as such. Probably very little difference in reality, two horns one bull etc, but those small differences can often give you a particular flavour you are looking for. Unfortunately there is no demo of the FAC Maxima, and the surrounding hype from the Chorus "Omg omg omg, this is the chorus to end the world" etc, then the following sale that made it a no brainer to test and quite simply was just another chorus, has not got me rushing out to buy Maxima. I will probably get it when i start recording more vocals on IOS because im oldschool with my mixes and prefer Limiters to compressors, but im not in a mad rush to replace no limits. Speaking as a 'synthy ambient man (of certain age)' I would protest that FAC Chorus definitely sounds a fair bit more special than the average chorus - especially ones i've used on iOS. I am able to get a stereo presence with the audio that I can't recreate using the built-in Modulation Delay fx, or other chorus plugins I've tried. Maxima, however, definitely sounds more subtle than a straight-up transient shaping compressor/limiter - so perhaps not something I'd have much use for in the mixing stages. I was under the impression that maxima did some magic shenanigations under the hood. Like magic compression without having to mess around with threshold, ratio and all the precision sound engineering that can be cumbersome for the uninitiated. That is how it feels to me. But of course there is no such thing as magic. Magic = stuff not yet under my false sense of control or understanding. The world shall kneel before my over inflated sense of comprehension. Arthur C. Clarke's 3rd law. I can't wait for self-driving dronecopters. Too much fun. Theres that other thing i despise "It sounds special, especially on IOS" ahhhhhhhhhhhhhhhhhhhh, its just a computer operating system FFS (Not pointed at you by the way, you know i have big respect for your opinion on these matters) but i do see it regular on AB etc "OMG OMG OMG OMG this thing shits pixies and pisses unicorn juice, best you can get ever ever ever...................................…………….......................................... on IOS"
Its an average chorus in comparison to a bunch of VST, i dont compare on price or platform. A good example, @brambos Troublemaker, that thing does its job in comparison to a ton of VST, in fact i put it top 3 at least and probably no1 for me if you include the sequencer. I like FAC Maxima a lot. I’m not the best when it comes to mixing and mastering, but when I’m done taking a swing at mixing, I use Maxima on the master channel to make things as loud as I want them without clipping. I wanted an AUv3 limiter/maximizer, and it was hard for me to make a choice between Maxima and DDMF NoLimits. They’re both super cheap, but I try to not buy everything in the App Store haha. I’ve read good things about both, from what I decided looked like informed reviews, but ultimately Maxima has a nice 6 second wave readout and is slightly cheaper. I dunno about it being only useful for a subtle effect, but here’s a little 2.5 minute video of me tweaking the parameters a bit on a loop in BM3. Note I also switch the mixer between peak and RMS. For me 'best available on iOS' is very significant, as my aim is to build a completely mobile production suite that tries to avoid the need to switch to desktop. 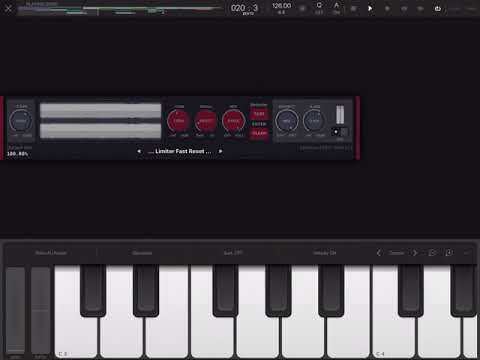 I'm not suggesting it beats or matches options on other platforms, but by my estimations FAC Chorus is my favourite iOS chorus based on sound, performance and price. I'm not suggesting it beats or matches those on other platforms, but by my I estimations FAC Chorus is my favourite iOS chorus based on sound, performance and price. No disagreement here, i never said it wasnt the best on IOS, i have been pretty clear and said i think AUv3 on IOS are in the infancy period, like the days of DX plugins. The ports of VST plugins tend to be 1:1 so it is nothing to do with any inherent flaws in IOS. As for the mobile thing, trust me, if i could, i would be iPad and xkey air (Hmmm sensel morph instead maybe) and headphones, i really hope to be before i croak. Right now it would take me hours to make a Neuro or Reese because of all the resampling that you cant do one click, my average Neuro is resampled like twenty times from the first recording of a hair dryer to the finished playable Neuro, before resampling in place on the timeline haha. So yeah, desktop one click only right now. There are a few huge gaps in the effects for that sort of work too, tape/magnet/saturation are sadly missing, and not even a hint of a transient designer.